Alabama’s poultry industry and the Alabama Department of Agriculture & Industries are part of a nationwide effort to respond to a possible outbreak of Avian Influenza (AI), the largest animal health emergency in U.S. history. As waterfowl from Canada migrate southward beginning this autumn, state and federal animal health officials will be on a heightened alert for a re-emergence of the disease. State agriculture commissioners, secretaries and directors throughout the nation have forged a working alliance with the USDA to develop and implement a sound risk management and disaster assistance program based on flock plans and compliance agreements to alleviate the significant expenses born by poultry growers. To date, USDA has issued as much as $600 million in indemnification payments to assist in cleanup efforts, with an additional $500 million committed to address another outbreak. Alabama is the nation’s second largest producer of broilers, second only to Georgia, with 21.5 million broilers placed each week into production. With approximately 2800 commercial poultry producers, Alabama’s poultry industry has a $15.1 billion impact on the state’s economy, employing some 86,000 people. In addition, there are many more game bird, game fowl, and backyard poultry flocks. 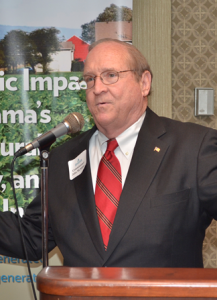 “If there is an outbreak of Avian Influenza in Alabama, a control zone will be set up around the affected area,” said Commissioner John McMillan of the Alabama Department of Agriculture & Industries. “We want to thank the Alabama Poultry & Egg Association for their diligence in working on this comprehensive plan. The control zone would be made up of an infected zone, buffer zone, and surveillance zone. These zones would vary depending on the location and logistics but generally would be a total of 10 kilometers in diameter. Testing would be required at least weekly in the infected and buffer zones of all poultry premises. All these samples would need to be collected by trained state personnel and tested in one of the state diagnostic labs, amounting to thousands of samples daily. All positive flocks must have flock plans and compliance agreements to cover procedures necessary to develop response and emergency plans. Quarantine and control zones may restrict movement of all poultry and equipment especially in the infected zone. Poultry plants in a control zone may experience delays. Most poultry plants have an annual payroll of between $12 and $48 million. There are 19 poultry processing plants in Alabama, processing more than 21 million broilers per week. This could affect other industries also, especially the cattle industry if a stockyard or other livestock was located within an infected or buffer zone.